The best way to start is to follow best practices. These practices are translated into code in a plugin named Sample that is distributed along with the server. That Sample plugin can be found here. Engine: I have created the main header, have you got something to do? Engine: I have created the main navbar, have you got something to insert? Engine: Well, I’ve spitted out my jQuery files, anything to add? Plugin: Certainly! Please add references to these files! If you reveal the source code of the final page, you will see references to these two files. There is a similar method to insert your own CSS code (onEndShowStyles). And you are ready to go, no server restart required. The GNU social cycle will load your plugin and insert your code in the final result. Little or no modification at all necessary for the HTML code of the upstream themes. In each request, the engine only creates one form, that of the main notice. It doesn’t create a form for the replies. Instead, it is created every time a user activates a reply by copying the main notice form with jQuery. This is important, because you can’t add the label to a form that doesn’t exist yet. So I put it there and expect it to be copied along with the rest of the form. This design decision has some effects on the jQuery behaviour assignment that we will see later. When you hack on GNU social you have jQuery and jQuery UI available. This is very convenient to rapidly build interfaces. 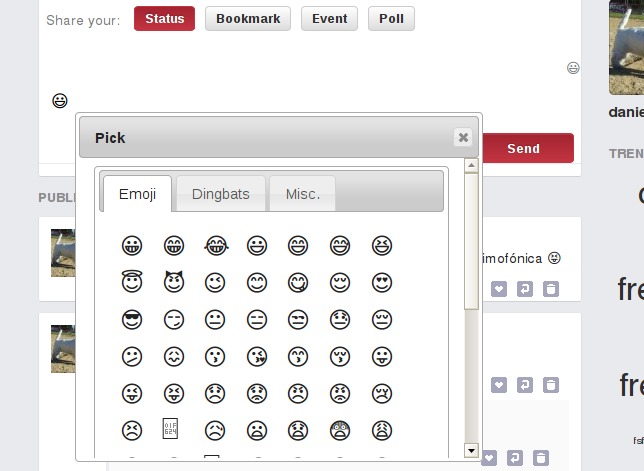 I chose the controls Dialog and Tabs to present the Unicode entities. As I said earlier, I can insert a control and assign a click function to it with jQuery if that control exists, but the controls for opening the dialog in the replies don’t exist until I click on a “reply to” button in any notice. But jQuery, great library as it is, brings us a solution. If I assign this click function to document and specify a selector, it will automatically add the behaviour to any new element that matches the selector. 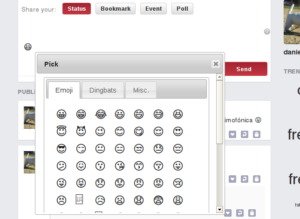 Having worked around that, I only have to make sure that each click on a smiley puts it in the appropiate form (the main one or a reply form). Have a look at assets/js/config.js. 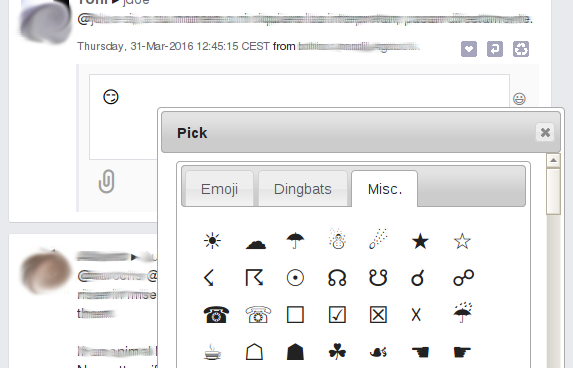 If you want new icon sets (see http://unicode-table.com/en/) you only have to find the initial (decimal) number and the final number and add the set as I have done with “Emoji”, “Dingbats” and “Miscellaneous”. Not all entities will appear on all combinations of operating system/locale/browser but you can try! And last but not least, browse the code for this plugin in https://git.gnu.io/danielside/SmileysUnicode. If you maintain a GNU social node, feel free to install it and hack around.